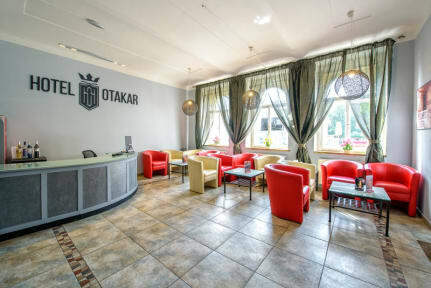 Hotel Otakar kohteessa Praha, Tšekki: Varaa nyt! 1 month prior to arrival we will charge the total groupe amonut - all the modifications can be made for free more than 1 month prior to arrival. Situated in the Center Zone of Prague in a beautiful secession building. Walking distance to Vysehrad, Congress Centre & just 4 tram stops to the Museum / Wenceslav Square. Restaurants, amenities, internet-cafe & entertainment places all nearby. Nice, cozy, family hotel close to the historical centre of Prague. - Comfortable single, double, triple rooms with extra beds on request. - Hotel is close to many parks, jogging tracks, fitness and wellness centers.